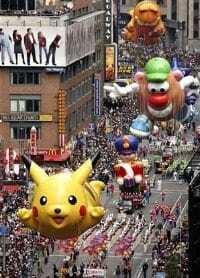 Get a front row, warm and private view of the NYC Macy’s Thanksgiving Day Parade with over 20 options for PRIME views of the Parade! Starting to re-think standing outside in the cold with no food and no bathroom for 6 hours at the Macy’s Thanksgiving Day Parade? Normally, I’d tell you all the good indoor spots are booked a year in advance, but with so many well-priced options from which to choose, there is no need to suffer!